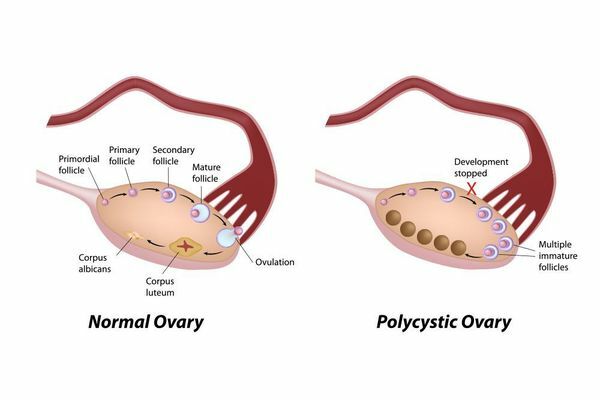 Polycystic ovarian syndrome (PCOS) occurs due to a hormone imbalance, which affects fertility and the ability to have a child. PCOS can cause acne, unwanted facial hair, and cause irregular, unpredictable periods. Our doctors at the Fertility Center of San Antonio can treat PCOS through lifestyle changes, prescribed medications, or progesterone hormone therapy at our San Antonio, TX, practice. In a polycystic ovary, the ovulation cycle does not occur properly. PCOS is a hormonal condition which leads to ovulation issues. Eggs may not develop properly within the ovaries or may not be released during ovulation. PCOS is one of the most common causes of female infertility, affecting six to 10 percent of the female population. While the exact cause of PCOS is not known, most experts believe that several factors play a role, including genetics and excess androgen production. While some women develop cysts in the ovaries, others may not. Most often, women learn they have PCOS in their 20s and 30s, after seeking medical care for difficulties conceiving. Irregular menstrual cycles: Women with PCOS may miss periods or stop having them. Others have shorter cycles of 21 days or less. Acne: PCOS patient may develop acne on the face, chest, and upper back. Too much hair: Hirsutism, or hair on the face and other body parts where men usually have hair, affects up to 70% of women with PCOS. Thinning hair: This may resemble; male-pattern baldness. Darkening of the skin: This occurs particularly along neck creases, in the groin, and underneath breasts. Skin tags: These small excess flaps of skin may be found in the armpits or neck area. Excess insulin: An excess of insulin may increase androgen production, causing difficulty with ovulation. Genetics: Research suggests that certain genes might be linked to PCOS. Low-grade inflammation: Research has shown that women with PCOS have a type of low-grade inflammation. Excess androgen: The ovaries produce abnormally high levels of androgen, sometimes called a male hormone, resulting in hirsutism and acne. Physical exam: Your doctor will measure your blood pressure and body mass index (BMI). They will also look at your skin for extra hair acne, or skin discoloration. Pelvic exam: A pelvic exam may be performed to evaluate the size of your ovaries and to check for other signs of a hormonal imbalance. Pelvic ultrasound: This device uses sound waves to examine your ovaries for cysts and check the health of the endometrium. Blood test: Blood tests check your androgen hormone levels, and other hormones related to health problems that might be mistaken for PCOS, like thyroid disease. Your doctor may recommend weight loss through a low-calorie diet combined with moderate exercise. Even a modest reduction in your weight can improve your condition. Our team can also help you with other simple lifestyle changes to alleviate your symptoms. Additionally, your doctor might recommend a combination birth control pills or progestin therapy to regulate your menstrual cycle. We might recommend medications to help you ovulate. The fertility doctors at our center can improve your chances for a successful pregnancy with PCOS treatment. Call us today at (210) 692-0577, or reach out to us online. "Even though we have a fertility center close to home, we chose to drive many miles because we were made to feel so comfortable and at home at Fertility Center of San Antonio. It was worth the time and money! Our miracle baby is now 4 years old!" - Eliza S.
"After many year trying to conceive, my husband and I are now pregnant. The Fertility Center of San Antonio staff did an outstanding job figuring us both out. Their service and dedication to our situation was beyond our expectations." - Jennifer J.